As a consultant for El Comercio newspaper for over a decade I was able to work on the redesign of 15 magazines and many books. 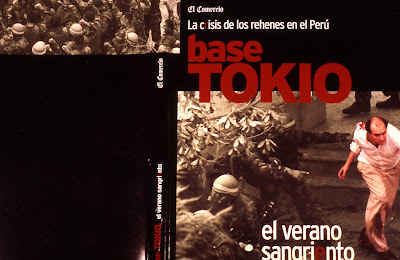 Base Tokio was a book about how terrorists held hostages in Lima's Japanese Embassy. I suggested the book jacket to have an image of the liberation moment. The main headlines and sub heads were designed with type cut-off enhancing negative spaces. We used a clean Bauhaus interior grid and design. To enhance the documentary feeling I adviced the use of black and red type trough out the opening book chapters. 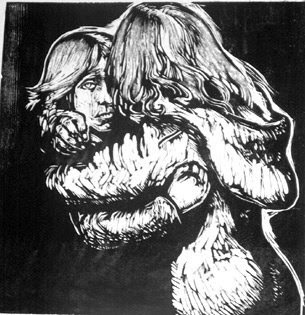 In this wood engraving print I was more concerned with showing the emotion and expression of the child rather than the mother kissing the child farewell.